Claire for Scrap My Way called yesterday to see if I might have the Score, Fold Create book. There is card in there that she had seen on a blog. I did not have the book. After looking at a few sites that had completed Flexy Fold Cards it appears that the card is scored and cut into 3 sections. I thought why not just make a SVG template for the card. Now making a template I was limited to the width of the card. I do think that mine is maybe a little over a inch smaller in width. That's fine with me at least I want have to glue the sides to the back. I really like the style and how the card bows. This is done by the slits that are in the panels. That was another reason I would prefer to have a file and not have to cut these slits by hand. I'm not sure if there are slits in the original card but it sure looks like it from a pic I was able to find of the pattern in the book. My file also contains all the panels and they too have the slits. I added the top border to smaller panel, this is welded. You could decorate it anyway you choose. The file does not contain the flowers etc. Just the card base and panels. If you would like the files just let me know and I will email it to you. Use the contact me section at the top. Here it is. Makes me think of spring. All pure and clean with the pretty little birds. OH HOW PRETTY! First of all, GREAT job on the cut file design! Definitely sounds so much easier than cutting by hand. 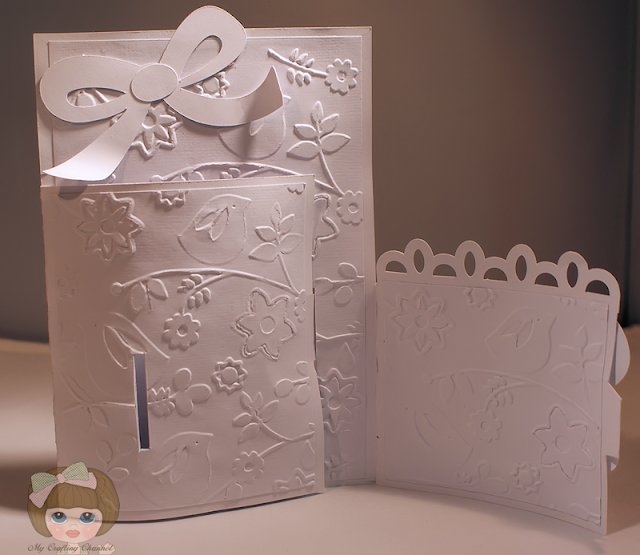 I love that you did it up all in white and the embossing, bow and little touches are beautiful. love this fancy fold card Nana! Aw too bad I don't have a cameo so I can't ask for a template.... boo hoo!!! !Great white on white card the embossing really pops out too! Did you save me a piece of that yum yum cake!!!! The embossing on this...so so so cool. Love it in all white. Gorgeous card! 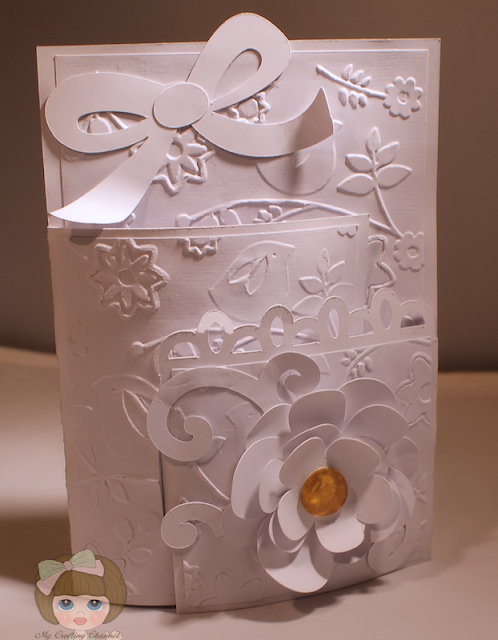 Love the white on white and the embossing is beautiful! Great fold! Thanks for joining in the challenge at LSP! Nana, this is AMAZING! Abosolutely stunning!!! It is beautiful Nana,I like the white on white and the embossing. I love this card!!! It's just gorgeous in pure white! Love the bow cut at the top too! I'm going to have to try that fold!!! This is very pretty!! Hope you will visit my new linky party starting on Monday. 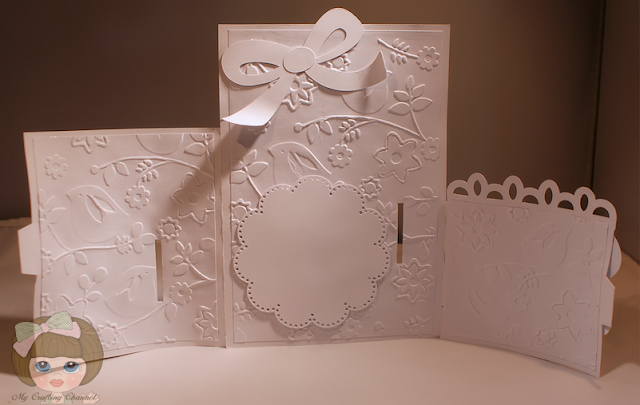 Beautiful embossed white card.love the fold and flower. I hope you had a wonderful birthday!!! Gorgeous card! Love the design! Ps Happy Belated Birthday-- the luxury to lay in bed all day what a gift! What a gorgeous card! I LOVE all the beautiful embossing and the fold is really lovely! This is seriously GORGEOUS!! !Love the Elegance of the card! !Very BEAUTFIUL!! OMG!!!!!! This is incredible...you are AWESOME!!! THANKS!! Such a beautiful card and such a different flod. I love it! Amazing card... is there a tutorial on this? Can it be made without svg file... would love to know how to make it. I would love written instruction, I have a file disability, lol. I can't figure them out. Beautiful embossing and love how this card opens!!!! Gorgeous!!!! !